Laissez-faire remains in the news. No, the headlines are not referring to it explicitly. But it’s there because we perpetually ask how much government should leave the economy alone or intervene. And our answers, as always, come from decisions about free trade, national spending, entitlement programs, taxes, and regulatory policy. Thinking about laissez-faire took me to the Index of Economic Freedom. 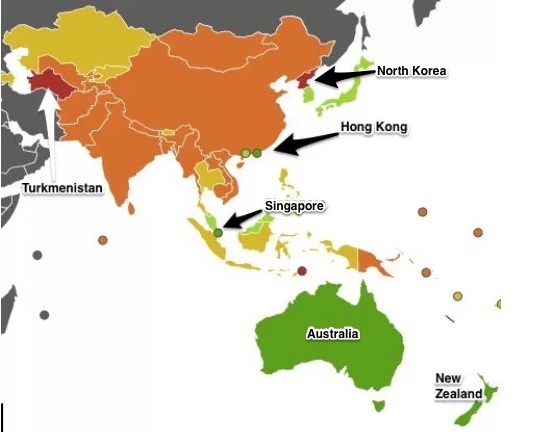 Through their heat maps, we can see which nations have the least government economic intervention and which have the most. We can also learn more about ranking criteria that range from bureaucracy and property rights to taxation and government spending. One major change from 2018 was the U.S. move from #18 to #12. 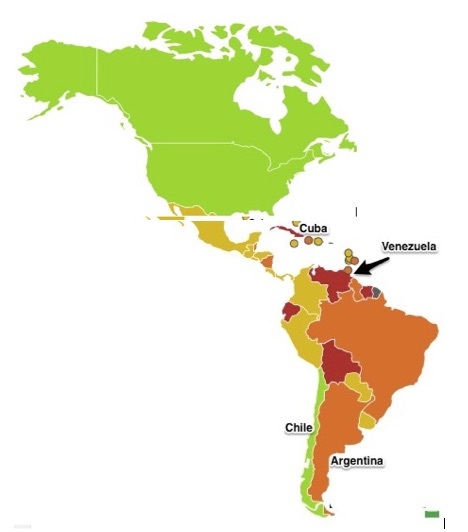 In Central and South America, the economy with the least government influence (and the only one that is shaded green) is Chile. At the other end, almost tied for the bottom, are Venezuela and Cuba. However, you can see by their color that Bolivia (#173) and Ecuador (#170) are ranked close to the least laissez-faire in the world. 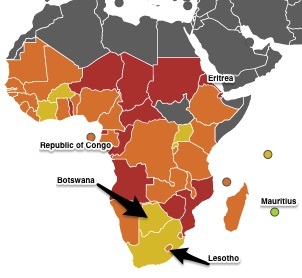 Sub-Saharan Africa just has Mauritius (tiny island dot) in green while Botswana still tops the list of “Moderately Free” economies. Grouped with the “Repressed” nations, Zimbabwe, Republic of Congo, and Eritrea are in the same category as North Korea, Cuba and Venezuela. My sources and more: For much more detail about the economies of 180 countries, The Index of Economic Freedom, though certainly biased, has a wealth of information. Not identical to the Index of Economic Freedom, the World Bank’s “Ease of Doing Business” tables also provide clues about where government is and is not burdensome. And finally, for much more about Adam Smith (1723-1790), econlib is always a good resource. Please note that today’s econlife updates our 2014 and 2018 post, “The World’s Top and Bottom Laissez-Faire Countries.” Also, I apologize that my copy of the Americas map virtually eliminated Florida. Our featured image is Adam Smith.